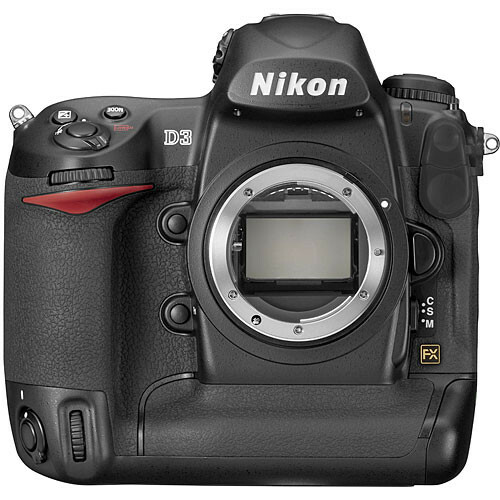 The Nikon D3 Professional SLR Digital Camera features the exclusive FX-format CMOS sensor, measuring 23.9 x 36mm, which is nearly identical to the size of a 35mm film frame - thereby eliminating any significant crop factor or focal length multiplier. Images taken with the D3 exhibit exceptional overall quality, broad tonal range and depth, along with extremely low-noise throughout its normal ISO range of 200 to 6400. Furthermore, by setting the camera to its built-in options of Lo-1 or Hi-2, the ISO range of the camera can be expanded to the equivalent of ISO 100 or ISO 25,600 respectively, offering unmatched versatility in practically any shooting situation. Designed with sports photographers and photojournalists in mind, the Nikon D3 incorporates the EXPEED Image Processing System that is central to the blazing speed and processing power needed for many of the D3's performance features. Thanks to this exclusive processor chip, the D3 has incredibly fast reaction times with a shutter release lag of only 37 milliseconds, and a start-up time of approximately 0.12 seconds. The D3 is also capable of continuous shooting at up to nine frames per second in full resolution FX-format for up to 64 consecutive frames in JPEG compression and up to 20 frames when recording NEF (RAW) files. The camera can even record images at a mind-boggling rate of 11 fps when shooting in DX-format (5.1 Megapixel) mode. The D3 introduces a range of innovative technologies and features that significantly improve the accuracy, control and performance professional photographers can get from their equipment. For example, Nikon's exclusive Scene Recognition System advances the use of Nikon's acclaimed 1,005-segment exposure sensor to recognize colors and light patterns in order to improve the accuracy of auto focus, auto exposure and auto white balance detection functions, while Nikon's Multi-CAM 3500FX auto focus module features an intelligent array of 15 cross-type sensors and 36 horizontal sensors, that can either be used individually or in groups, with the option for Single Area AF mode and Dynamic AF modes, and also features 3D Focus Tracking with automatic focus point switching as it uses color and light information to accurately track the subject. These innovative technologies are also instrumental in making the Nikon D3 one of the easiest Professional cameras to use. The Picture Control System makes it easy for users of all experience levels to select and apply adjustments, and offers four basic setting options - Standard, Neutral, Vivid and Monochrome. Photographers can also customize and store up to nine customized options in the D3 and export up to 99 to a CF memory card, enabling photographers to share settings among multiple D3 cameras. Furthermore, the D3 features an Active D-Lighting mode that, when enabled, provides remarkable real-time highlight and shadow correction with optimized image contrast. The D3 has been designed with refined ergonomics and usability and a streamlined, aesthetically pleasing layout so photographers can take pictures with greater accuracy and comfort and with less concern about fatigue. The camera's viewfinder provides virtually 100 percent coverage for accurate framing, while an ultra-high definition, 920,000-dot VGA LCD screen on the rear of the camera displays images with vivid color and clarity. The 170-degree wide viewing angle makes composing shots using the LCD screen in LiveView mode easy, and the camera also features a unique Virtual Horizon digital level sensor that indicates the camera's alignment relative to the true horizon on the rear LCD screen or in the viewfinder. The cameras impressive durability means that it can be used under the most demanding conditions. The exterior of the D3 is crafted of magnesium alloy and the camera's shutter mechanism is tested to 300,000-cycle releases. Furthermore, the 3.0-inch LCD is strengthened with tempered glass and the comprehensive array of rubber gaskets and seals protect vulnerable entry points from dust and moisture. The Nikon-original 12.87 Megapixel FX-format (23.9 x 36mm) CMOS sensor provides a high signal-to-noise ratio, wide dynamic range and 12-channel readout to delivers breathtakingly rich image quality with an effective resolution of 12.1 million pixels, while also reducing noise to unprecedented levels, even at high ISO sensitivity. There are also Two Crop Modes - the DX format and a 5:4 ratio crop. When the FX-format is used there is no significant crop factor so a wide angle lens is still a wide angle lens. Furthermore, the EXPEED Image Processing Engine provides up to 14-bit A/D conversion and 16-bit image processing for superb tonal gradation. Shoot up to 9 fps consecutive shooting at full FX resolution and up to an incredible 11 fps in DX Crop mode. Plus the camera has a start-up time of approximately 0.12 seconds, and a shutter release lag of only 37 milliseconds with a viewfinder blackout time that is a mere 55 milliseconds. The cameras has an extremely broad range of sensitivity extending from ISO 200 to ISO 6400 natively, and that sensitivity range can be expanded down to ISO 100 or up to ISO 25600 using the Lo-1 and Hi-2 settings. The D3 incorporates Nikon's Multi-CAM 3500FX auto focus module that features an intelligent array of 15 cross-type sensors and 36 horizontal sensors that can either be used individually or in groups, with the option for Single Area AF mode and Dynamic AF modes using groups of either 9, 21 or all 51 focus points. The system also features 3D Focus Tracking with automatic focus point switching that takes advantage of all 51 AF points as it uses color and light information to accurately track the subject. Nikon's exclusive Scene Recognition System, combines the camera's metering with an enhanced 1,005-pixel 3D Color Matrix Metering II system, and the cameras AF sensor array to provide intelligent light metering capabilities, along with smart white balance detection and fast AF performance for precise exposures and sharply defined images. Active D-Lighting enables real-time highlight and shadow correction with optimized image contrast by automatically applying tone compensation at the moment of capture, while applying localized tone control technology to achieve a more pleasing level of contrast across the entire image. The D3 Picture Controls streamline in-camera image processing by enabling customization of image parameters before capture and offers complete control over sharpening, contrast, brightness, hue and saturation in various color modes. Picture Control settings include 4 preset options (Standard, Neutral, Vivid and Monochrome), as well as 9 customizable settings. The 3.0-inch super density VGA resolution (920,000 pixel) color monitor has an effective wide viewing angle of 170-degrees that makes it possible for even more critical image review. The display also incorporates a tempered-glass protective cover for greater durability. The LiveView feature offers two modes for utilizing the high-resolution 3-inch LCD monitor as a tool for framing and composing your shots while shooting. The Tripod mode is designed for precise focus and accuracy when the camera is on a stable platform and the subject is not moving and focuses on the subject using focal-plane contrast. The Handheld mode allows photographers to use the camera's conventional TTL focusing system, with all 51-points and 15 cross-type points whereby the camera activates focusing immediately when the shutter button is pressed, to ensure accurate focus. The camera body is constructed from durable Magnesium alloy and has been built to withstand the rigors of the harshest of environments. The durable Kevlar/carbon fiber-composite shutter unit has been tested to 300,000 cycles - a clear indication of the advanced engineering and durable construction applied to this impressive camera body. Additionally the camera's control layout has been designed with ergonomic considerations at the fore - including optimized button placement for fast and comfortable handling. The D3 features two CompactFlash card slots that can be configurable for parallel (simultaneous) recording - to create a backup of your captured images; or for serial (consecutive) recording to capture any overflow images. Users can even set up the cards for separating recorded RAW and JPEG files or even copying pictures between the two cards to provide useable copies to a technician or customer. Images can be displayed directly from the camera to a standard video monitor using either NTSC or PAL video standards and the camera provides an HDMI video output interface that enables connection to a high-definition monitor using the camera's HDMI port and an optional cable. Capture NX offers exciting potential for Nikon Electronic Format (NEF) files, as well as JPEG and TIFF images. Refined through revolutionary U-Point technology, it greatly simplifies the selection of objects, colors or areas that support highly accurate alterations to myriad image elements, while preserving the integrity of the original image data. With the optional MC-35 GPS Adapter Cord, location information such as latitude, longitude, altitude and heading (direction) can be transferred from a compatible GPS device and recorded with the shooting data for each image. The Wireless Transmitter WT-4 (optional) allows WiFi remote operation (with optional Camera Control 2 software) and image transfer (with FTP software) or wired Ethernet connection. It supports wireless LAN conforming to IEEE 802.11b/g, IEEE 802.11a, (WiFi a/b/g) and wired LAN conforming to IEEE 802.3u (100BASE-TX) and IEEE 802.3 (10BASE-T) protocols, and provides a transmission range of up to 590 feet (IEEE 802.11b/g) or 850 feet (IEEE 802.11a). Max Sync Speed 1/250 sec. D3 SLR Digital Camera (Camera Body) is rated 4.9 out of 5 by 162. Rated 5 out of 5 by Joey from THE camera, a must have Shoots when you want it to shoot, it captures whatever shot you want when you want it. Great low lighting quality images, fast, and accurate White balance. This camera does not need flash. I shoot weddings, and I went from a D70 to D3 (BIG change) and although I have an SB800, I very seldom use it on my D3, especially in weddings. Best of all, when I shoot, no one knows I am actually shooting and as a result, I get great, natural shots that my clients love. It's like going undercover. This camera is an investment worth having whether you're a pro or not. And best of all, people are more willing to pose for me than when I had the D70. D3 makes anyone a PRO! Rated 5 out of 5 by AfMedic from Outstanding ISO performance! I've had this camera for about a month, and still testing it out. This is the camera I've been waiting for Nikon to produce since I got into digital photography. I can't say enough about it. The ISO performance is beyond my expectations, the build quality is what you have come to expect from Nikon, I love the huge LCD screen on the back. I didn't realize how much I missed FX sized images until I put my wide angles on, it's amazing. The image quality is so much better than my D2X (which was and is great), with rich colors, and I love the new Picture Control. Speaking of that, I can't recommend strongly enough that you get Capture NX2 if you shoot RAW. Rated 5 out of 5 by S&R Photography from Simply Breath Taking! This DSLR is simply breathtaking. It has no excuses. I took the plung after shooting with my Nikon D300 for about a year. The shutter release is simply smooth and highly responsive. The images are remarkable straight out of the box. It just simply goes. I don't feel as though the D3 is given it's full due. It is simply more than just speed and accurate focusing. The colors are simply gorgeous and fully rendered. The ability to shoot in low light at ISO'S up to 6400 are minor to it's ability to navigate from one feature to another on the fly. Metering on this camera is dead on. Simply place an 85 mm 1.8 on it and go to work. There's no question why Nikon is on top. Rated 5 out of 5 by Scott Douglas from Nikon Steps Up To The Plate The ability to shoot under adverse light conditions, without requiring the use of flash, is one of the most important features of the D3. When you own the camera, It is bound to influence the approach you follow in your day-to-day photographic challenges. The other new features and improvements that are incorporated in this camera make it a must have for the Professional Nikon user who desires full frame capability. The build quality is everything you'd expect from a camera of this level, and the 3 ultra sharp LCD screen with Live View capability is wonderful. In conclusion: if you can justify the expenditure - buy it..! If not, purchase the D300 as it incorporates many of the technological advances present in the D3. Rated 4 out of 5 by CanonNikon from Excellent but... This camera is excellent except from the mirror lock up mechanism. When using this camera to perform bracketed shots (e.g. HDR photography in continuous mode) it would be favorable if the mirror could stay up to all the exposures had been done. Now, the mirror goes up and down for every exposure, and every time you have to wait for the vibrations to stop. This is time consuming, and not convenient when the bracketed pictures has to be taken very fast. It is also not possible to combine the MLU function with the self timer. For most users this will not be a problem, but for others this can be a issue to consider. Rated 5 out of 5 by Anonymous from Confidence, simplicity, fabulous results As said by others, this camera shoots great pics straight out of the box. The low light performance is exactly what everyone has raved about, and using auto-ISO makes using this camera a breeze. There is far more this camera can do than I will ever need to use, but the assured great results make it worth every cent. The high speed capabilities, shooting with a 70-200 2.8 on my first weekend shooting my son off a high dive were nothing short of spectacular. It is a HUGE leap up from the D200, but the knowledge gained in using the D200 makes adapting to the the D3 straightforward. Expensive, yes, but if you can afford it and love to shoot, it won't disappoint. And, you won't have to take any flack from your Canon buddies, either!